If you missed the back story on Smart Things, now that it’s been acquired by Samsung for a reported $200 million you might be curious! Alex Hawkinson continues his 15-year leadership path with cloud-based technology companies as Founder and CEO of SmartThings, a platform to connect and control objects in the physical world remotely. Two things he said about the next phase of how we interact with the internet, the Internet of Things. First, it’s up to us if we want to start living like the Jetsons or deciding what we will accept; and it is hard to know how things like companies are valued. Imagine the things you’d like to be able to monitor or activate by pressing buttons on a digital device. 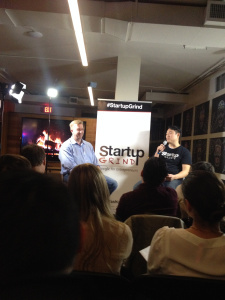 Alex told the Startup Grind DC attendees that he is working through his company, SmartThings, to promote a software platform to facilitate creating a connection with things.